Welcome to our cat page. 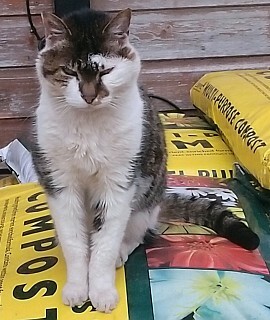 Our 2 resident cats are 16 year old Barney(pictured) and Twiglet, who is definitely boss of the shop and can be found sleeping in there every day as she takes her duties very seriously! We stock many brands of wet and dry cat and kitten food. We also stock a wide range of health and care products. Also dishes, toys, play-stations, scratching posts, collars, litter trays, deodorisers, disinfectants, small carrying boxes, grooming products, beds, blankets and cat treats. Where possible we try to buy in on special deals, so the prices may differ from time to time, but we always offer products at the best prices.